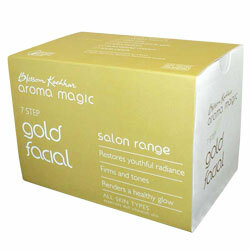 Aroma Magic Gold Facial Kit - Restore Youthful Radiance, Firms & Tones & Renders a healthy glow to the skin. Gold Facial Kit From Blossom Kochhar Aroma Magic Salon Range online Shop. This facial firms, tones and renders a healthy glow to the skin. All skin Types, Especially dull wheatish skin. Lightens skin colour. Balances uneven skin tone and pH level. Enhances skin brightness and improves complexion. Extracts of Garlic, Clove, Extracts of Witch Hazel, Rose, Organic Fruit Acid, Vitamin C and Pure Essential Oil of Rose. Helps to brighten, firm and give glow to the skin. Extracts of Rose, Marigold, Enzymes and Pure Essential oils of Patchouli, Grapefruit and Neroli. Apply one layer of sachet no. 4 all over face and neck and give Galvanic (+) current for 3 minutes. An age retarding complex that restores skin youthfulness by its lifting and firming action. Rejuvenates skin cells, maintains moisture balance, tones the skin, removes fine lines and wrinkles. Keep your skin young and glowing. Apricot, Elder Flower, Carrot, Basil, Jasmine and Organic Fruit Acid. Apply a layer of sachet no. 5 all over face and neck and leave it on for 3 minutes. Non greasy and absorbed quickly. Nourishes and moisturises to relieve dryness. Renews skin vitality to make it fairer, supple and youthful. Extracts of Rosemary, Jasmine, Vitamins A, C & E and Pure Essential Oils of Geranium, Vetiver & Peppermint. Massage with sachet no. 6 for 10-15 minutes. Wipe off. Helps to remove free radicals from the skin that causes skin damage and problems of pigmentation, wrinkles, skin ageing and fine lines. Lightens skin tone, tightens loose and sagging skin giving it a glowing and smooth texture. Extracts of Green Tea, Lemon, Carrot, Vitamin A, C and E, Pure Essential Oils of Grapefruit and Orange. Apply a layer of sachet no.7 all over face and neck, avoiding the eye area, leave it on for 15 minutes and wipe off. Apply sunscreen to ensure protection.